(May 9, 2017) -- The countdown is on for thousands of Roadrunners who have accomplished a monumental milestone in their educational journey. 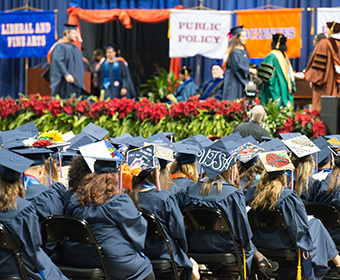 This week they walk the stage at one of three UTSA spring Commencement ceremonies. The ceremonies will take place Saturday, May 13 and Sunday, May 14 at the Alamodome. More than 3,500 undergraduate students, 880 master's students and 55 doctoral students are eligible to attend the ceremonies. Arrive two hours before the ceremony. Follow the signs to check-in. At check-in, graduates will pick up their name card, fill out the photo information and line up. Leave purses and bags with family. They're not allowed at check-in. During the ceremony, all names will be called. The ceremony will last 2—2.5 hours. Stay seated throughout the ceremony. After the ceremony, meet family and friends outside. UTSA graduates, family members and friends are encouraged to share their stories on social media using #UTSA and #UTSAgrad17.